Most successful people like Tim Cook and Michelle Obama begin their day even before the sun rises, but waking up early is one of the hardest habits to cultivate. 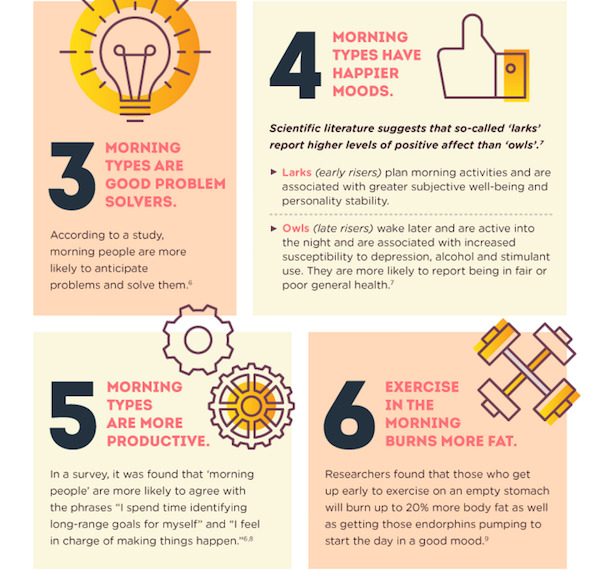 The health benefits, such as improving moods and productivity, of rising early are backed by many scientific research. If you are a night owl who wish to change, conquer your alarm clock and become a morning person using these simple techniques that were put together by CashNet USA. These tips include setting progressive goals, drinking a glass of water and waking up at the right point in your sleep cycle. Scroll down to view the infographic.